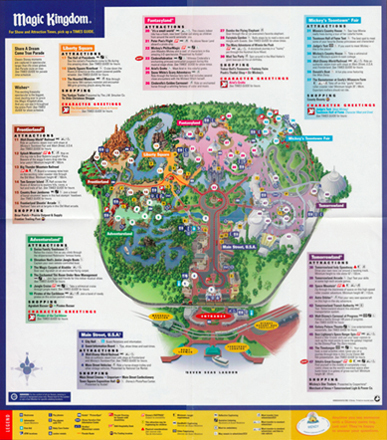 Several years ago, this was the park map. Folded up, it's the size of a typical brochure. 3 unfolds later, it is a large map. The 2019 version was this Guidemap, below. 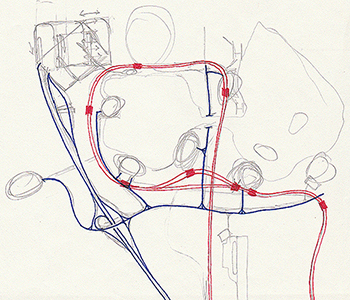 Less unfolding to get to the map, but still cumbersome while in the park. Each time I wanted to find the location of an attraction or the quickest route, I got frustrated having to go through the unfolding, turning, and folding ordeal. I knew what I wanted to go see, but had to pull out the big folding map, stop and turn or fold it to the applicable area. Several times during the day, I wished I had a simpler smaller map. One that I could easily and quickly access, even while walking around the park. 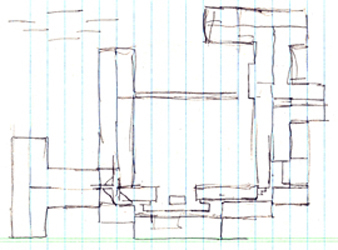 At some rest stop that day, I assessed, made notes, and sketched a smaller, faster map. I dubbed it the FastMap to convey its value and to respect and connect with the FastPass system in place at the quelines of the rides. 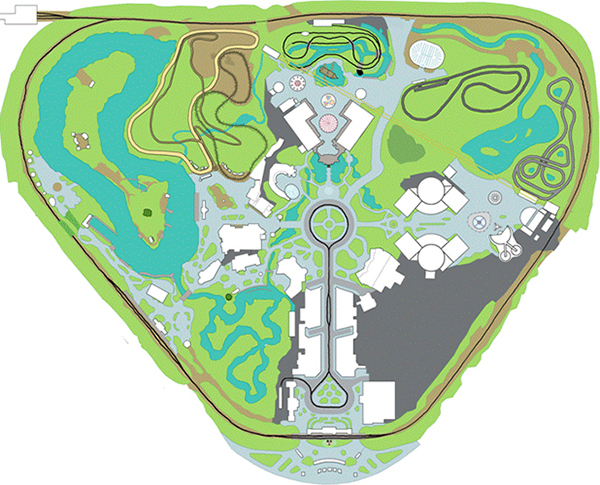 It shows only the major attractions and walkways. 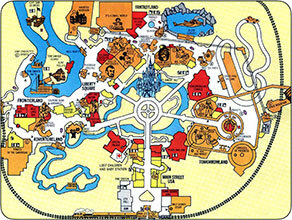 On the other side: promo info and resort map showing the other parks and areas. Dates: Concept May 2005. Revisions, comp Febuary 2014. First-time or infrequent visitors: those who need to plan their day, peruse, learn, and want/need info, detail, descriptions. The existing full map brochure or phone appswork for leisurely reading and getting detailed info. Repeat or regular visitors: those who need quick access to get somewhere, they want simple landmark icons and accurate walking routes. 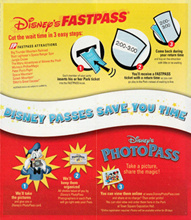 A simpler pocket-size map allows a quick glance to help the guest get to the next major attraction or area. 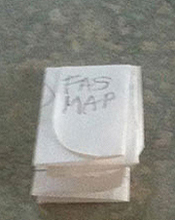 This FastMap could be a single card printed front & back or it could be a tear-off portion of the full map booklet. • Can be accessed and read while walking. • Fits easily in pocket; card stock and rounded corners. • Easy to read; few legends and little text. 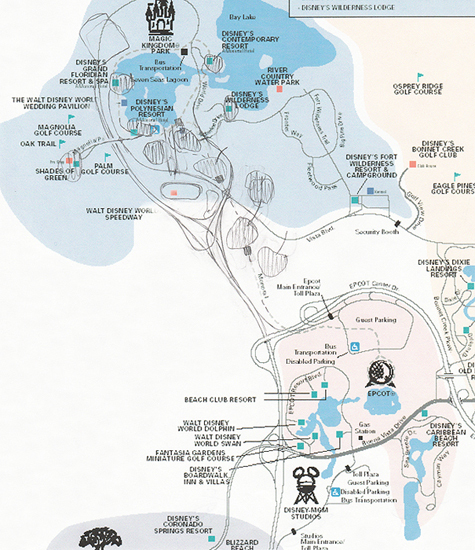 • Consistent - each park map has the entrance at the bottom - more intuitive and familiar. • Faster and easier than accessing the full map or an app. Above right: The hotels around Seven Seas Lagoon. Below: Entrance to the Magic Kingdom: walkway to the parking lot, tram station, and monorail station. Initially it was a nice adventure to take the monorail or a ferry from the parking lot over to the entrance to the park. Then, as more attractions opened and guest's crammed more adventures into their day, the wait time to get to the park became more of a nuisance. Moving the lot matches the set up at the other parks, each with their own parking lots by their entrances. 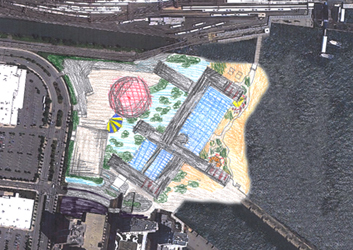 This plan would also decrease the passengers on the monorails and ferries across the lake. The monorails could then be repurposed for better inter-resort travel. 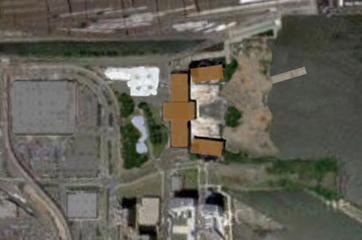 The former parking lot could be used for additional hotels. The WDW experience is greatly enhanced when guests can stay on the property and travel by public transit to the attractions, shows, shopping and meals. Sitting in traffic at WDW is not much of an escape. 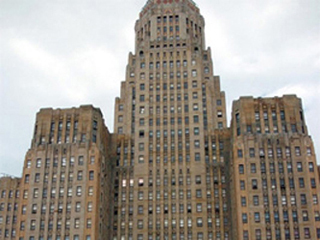 More hotels could accommodate the demand and provide more budget opportunities for guests. One of the unique attractions at WDW is the smooth and quiet monorail that glides above the landscape and traffic. This should be expanded and exploited into a more thorough transit system. 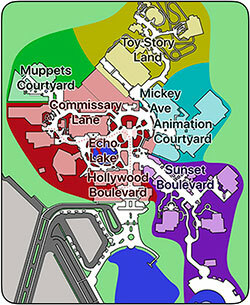 It should connect more hotels, all the parks, and Downtown Disney. Dates: Concept and sketches May 2005 & 2009. 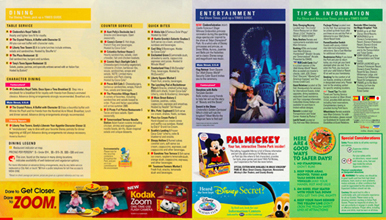 The Disney Company has a large presence in New York City through their Broadway shows. And, while they have resorts in California, Florida, Hawaii, Paris, Tokyo, and Hong Kong, there is nothing in the densely populated Northeast. They tried a while back with an American-themed park, but it was too close to sacred Civil War battlefields and raised too much opposition. Cirque du Soleil has permanent shows in Las Vegas and Walt Disney World in Florida but nothing in NYC. They have mounted many shows in New York in a variety of venues. They, too would benefit from a permanent venue in the Big Apple. Dates: Idea and sketches 2011. Presentation: 2013. 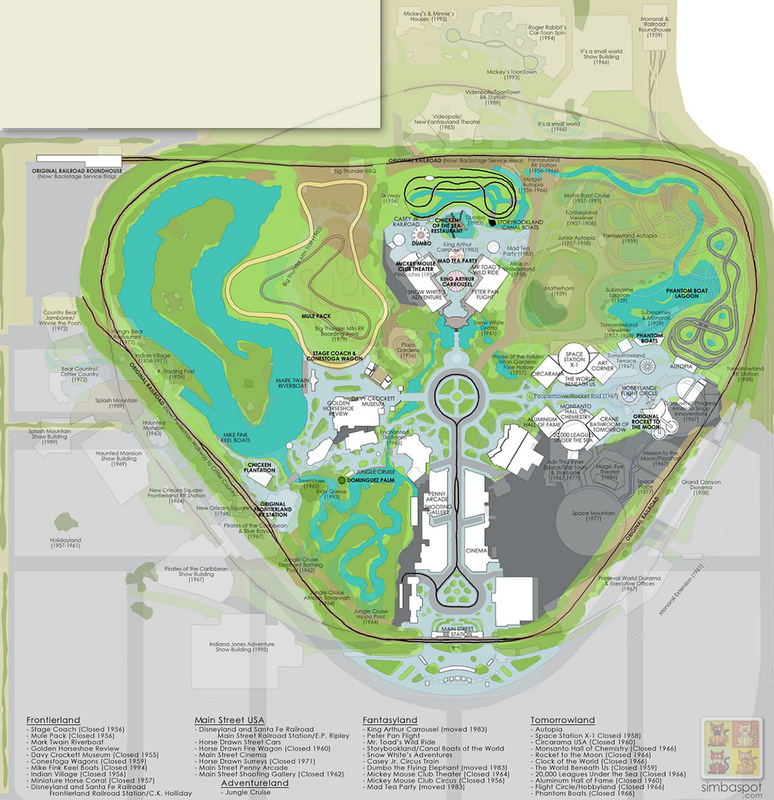 The concept: A vacation destination to appeal to the Disney fan with resort amenities, including an indoor/outdoor pool, waterfront location, and water sports; a permanent Cirque du Soleil showplace; and easy access to the Statue of Liberty, Disney on Broadway, and all that Manhattan has to offer. Much like resorts in Hawaii, Florida, California, and Asia; and on their cruise ships. 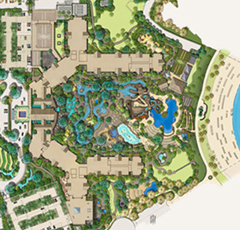 The resort could even include Disney timeshare units and vacation packages before or after boarding a Disney Cruise ship. But, a major problem for both Disney and Cirque is finding enough land in the city and then paying high Manhattan prices. Solution: Build a resort in New Jersey. Yep, instead of being in the city, have a view of the city. 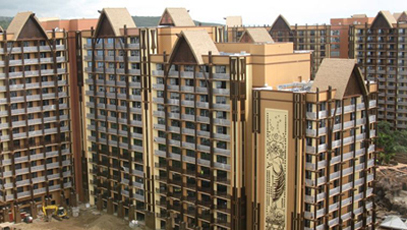 Like Disneyland and Walt Disney World, the resort is located in and part of a major amusement park - New York City. Guests would take excursions into the city, but from a resort getaway on the water, a resort that has the safe, familiar, and comfortable Disney attitude and service. 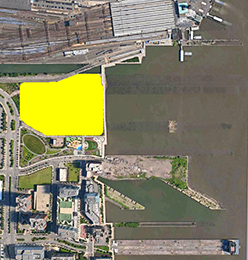 Location: On the Hudson River waterfront between Jersey City and Hoboken, across the Hudson from Greenwich Village, between Downtown and Midtown. Two blocks off of Interstate 78 and US1, and a short way from I-95, allows easy freeway access and convenient highways from all 3 NYC airports. 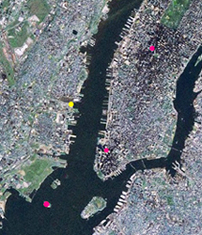 The red dots are, from top to bottom, Times Square, the new World Trade Center and the 9/11 Memorial, and the Statue of Liberty. At the very northern boundary of Jersey City. The Erie Lackawanna train and ferry depot is at the top of the photo. Newport Mall and movie theaters are at the lower left. 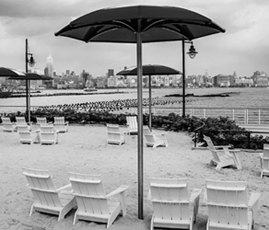 The resort on the Jersey City waterfront. 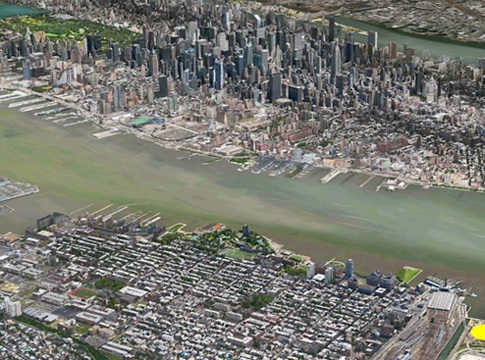 Below: Statue of Liberty on the far left. Views of Midtown Manhattan and the Hudson River from the resort. 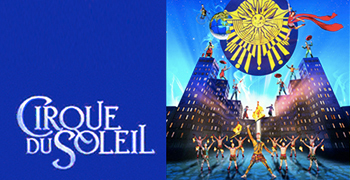 Cirque du Soleil mounts amazing and popular shows that tour all over the world and have a permanent presence in Las Vegas and Walt Disney World. 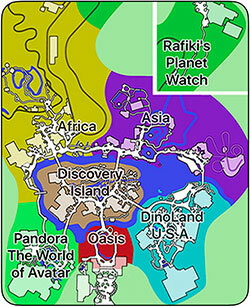 This NYC Disney show could have an urban, city theme and be integrated into the resort complex. The same ferries that transport resort guests would also ferry ticket holders from Manhattan to the resort venue. 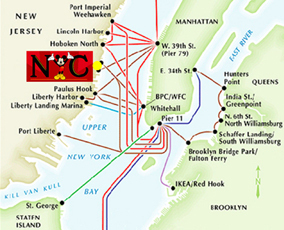 Numerous ferries ply the Hudson River. 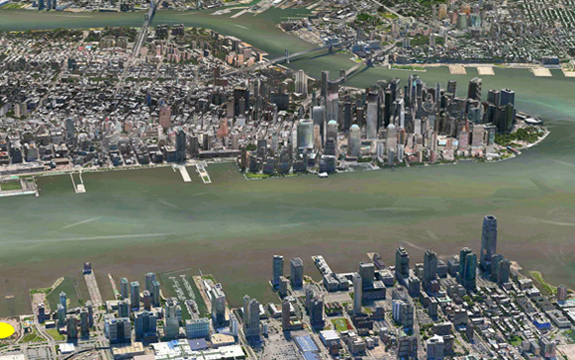 Above right: How the waterfront might look. The first cartoon starring Mickey Mouse was Plane Crazy. In 1928: the first cartoon with sound was Steamboat Willie. His next project was Silly Symphonies, merging music and animation. 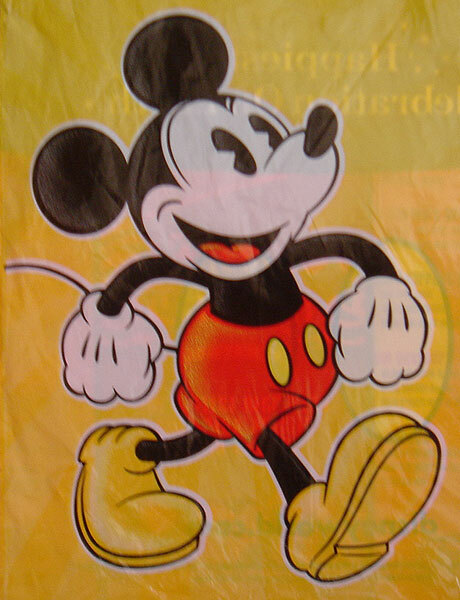 Distributors weren't too enthusiastic so Walt presented them as 'Mickey Mouse presents Silly Symphonies'. They were the first cartoons in color. 1936-37: Snow White and the Seven Dwarfs cost 1 million to make and earned 8 million (at (25 cents for an adult ticket). That profit funded the new Disney Studios in Burbank. Snow White was a struggle - doctors claimed that people would hurt their eyes if they watched a full-length cartoon, bankers didn't think people would sit through a cartoon that was that long. If the price of movie ticket and the value of a dollar were equalized since then, Snow White would be the second highest-grossing film of all time (Gone With the Wind would be number one). July 17, 1955: Disneyland opens. 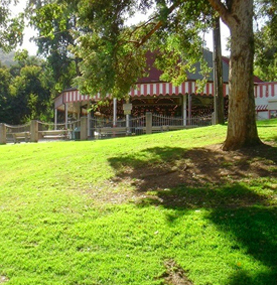 Walt's dream - a place where children and adults can enjoy a park together. 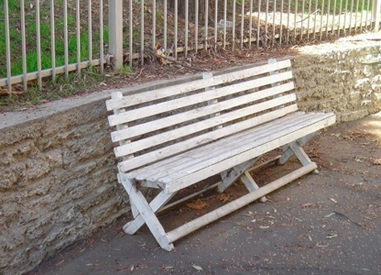 Clean, safe, and comfortable (that's why we enter down a familiar and comfortable small-town Main Street). 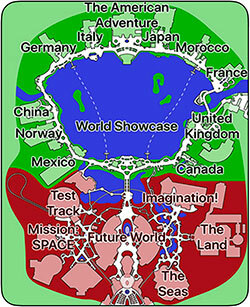 Concern over whether East Coast people would accept a second Disney park in Florida was satisfied when Disney built 4 attractions for the World's Fair in New York City in 1964. To avoid the peripheral schlock that sprang up around Disneyland, WED bought large acreage near Orlando, Florida, under the name of 'Project X'. They set up 'dummy' companies to purchase the land so as not to give away the Disney name (which would cause higher prices). M.T. Lott was one such name. They paid $80/acre until the Orlando newspaper broke the story, then the land sold for $80,000/acre. 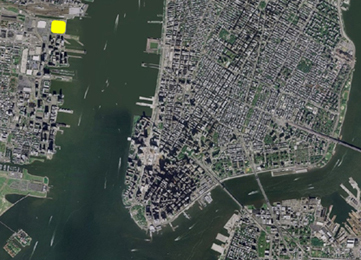 The last few parcels of land cost about the same as the previous large bulk. It was to be called Disneyworld (like Disneyland) but Walt died before it opened and brother Roy changed the name and insisted it be called Walt Disney World to honor Walt. Examples of forced perspective - diminishing window sizes to suggest greater height. Storytelling - Walt was a master at creating a synopsis. 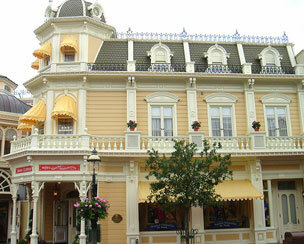 His mastery is carried on today - attractions, stores, and restaurants each follow thorough storylines. We humanoids love stories - they provide interest, empathy, life, connections, socializing. 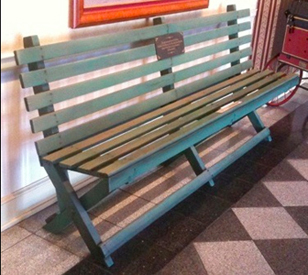 Attention to detail - the smallest element in the parks will have been thoroughly thought out and executed with finesse. 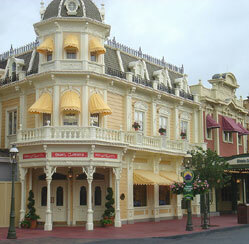 There is no public rest room in Liberty Square because those didn't exist at that time. The restraunts have restrooms but they are technically in other adjoining lands. 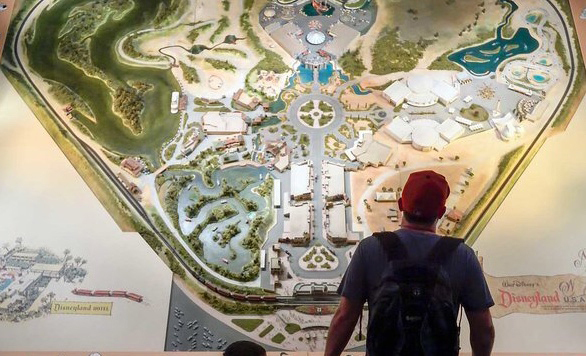 Innovation and exploration - Walt stayed ahead of the technology curve by envisioning attractions and films and then challenging the staff to make them happen. Lures - Walt called them 'wieners' At the end of each major street is a lure or enticement (the castle, rockets, buildings, etc.) that pulls you in to that area. Such barbs are used to grab a viewer/reader's mind. Somehow I can't believe there are any heights that can't be scaled by a man who knows the secret of making dreams come true. This special secret, it seems to me, can be summarized in four C's. They are Curiosity, Confidence, Courage, and Constancy and the greatest of these is Confidence. When you believe a thing, believe it all the way, implicitly and unquestionably. Whenever I go on a ride, I'm always thinking of how it can be improved. 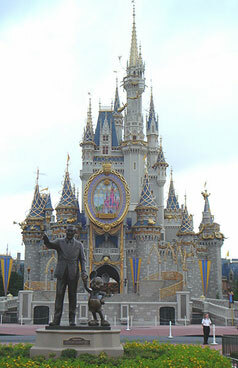 Statue of Walt and Mickey at WDW. 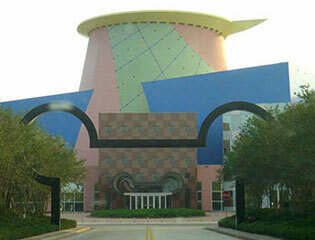 The Team Disney Animation building in Florida. Walt's favorite attraction: The Jungle Cruise. He wanted live animals but was told that they would be sleepy in the afternoon sun and that it would not be easy to control their whereabouts. So, Walt set out to develop animatronic animals that would perform on cue, all day long. What a phenomenal place, manufactured to be comfortable, satisfying, and exciting. I enjoyed it on several levels: reminiscing about visiting it for the first time in 1956 with the family - I could spot the locations where we had taken pictures of the three boys; appreciating the attention to detail, storytelling, and craftsmanship of the Disney imagineers; and just having fun. In LA, I took a walk in Walt's footsteps: houses and early studios. An incredible experience. Walt Disney is one of my role models, a mentor - his imagination, vision, talent, and persuasiveness to get things accomplished. I had been a fan since watching the Disneyland TV show, visiting Disneyland in 1956, watching the Mickey Mouse Club, and enjoying his many movies. So, here I was in LA at the site of his first home (he moved in with an uncle after he moved west from Kansas City) and three blocks down the street was the first storefront studio that he and his brother Roy opened - Disney Bros. Studio. I walked those three blocks twice seeing houses that Walt saw, wondering what his imagination was thinking while he made that walk every day. 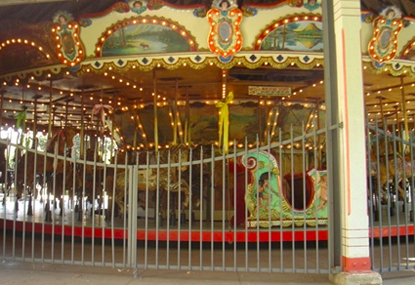 In Griffith Park, I saw the carousel where Walt sat and watched his daughters ride in the early 1950s. It was amazing to be in the same spot, almost unchanged, where he was inspired to create Disneyland. I drove the route he probably took from his home to the park. 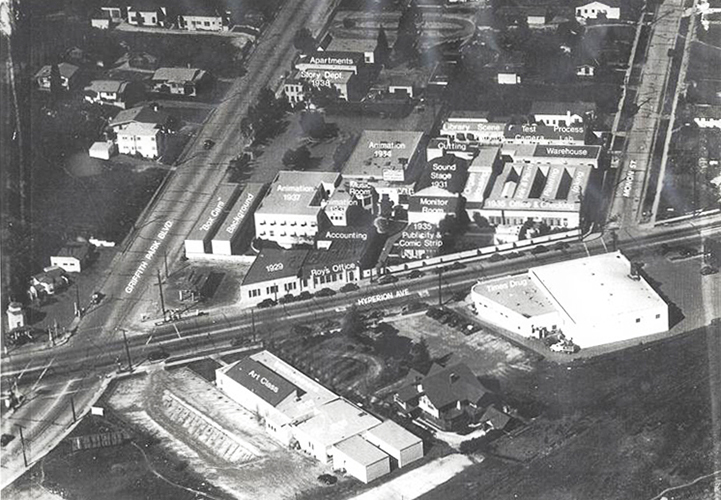 Above: 1955 and 2009. Below: 1956 and Overlay of 1955 and 2005 maps. More maps.